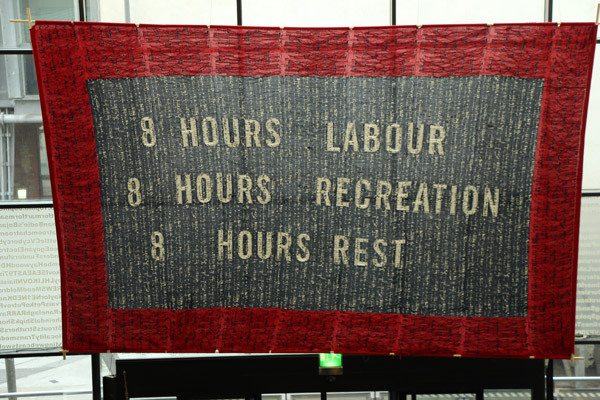 Reinterpreting the heritage of NW textile industry, whilst documenting the current experience of the freelance creative, Punchcard Economy is a machine-knitted banner based on the ‘8 hours labour, 8 hours recreation, 8 hours rest’ slogan coined by Robert Owen of the Eight Hour Day movement. The design incorporates data collected from a range of ‘workers’ in the digital, creative and cultural industries, auditing contemporary working patterns within the digital economy, and revealing the shift from Owens’ ‘888’ ideal. The final work is produced on a domestic knitting machine using a combination of digital imaging tools and traditional punchcard systems. The banner will be on display at FACT as part of the TIME & MOTION show until March. It was intended to measure 4.6m x 2.7 m. Clearly the standard tension sq for a 10cmx10cm sample has margin for error at that scale. A huge thankyou to everyone who contributed to the design by logging their hours. Thanks also to Mark and Andy for installing it today, to Mike, Ana, Emily and Lesley at FACT for supporting the idea so enthusiastically, and to Rob at Interconnect IT for sorting out this cracking website. Thankyou also to Arts Council and National Lottery England for supporting this work and the broader Knitting Digital research project.